The secrets and recipes of the most famous spice blends. They transform a simple dish into a stimulation of the senses culinary delight. Sophisticated formulations, combining masterful flavors of spices, to create even more beautiful ones. Join us on a trip to the fairy world of blends and let them seduce you. “God created the food, the devil the cooks.” – James Joyce, “Ulysses”. Diabolically seductive is the world of spices. A small treasure in the cupboard, which sends you in a breath on a dreamy exotic journey, without a destination. Flavours as if coming out of an oriental fairy tale, soft, sweet, angelic, strong or unexpected, spicy and aromatic at the same time. Colours of a Renaissance painter: the brown of the cinnamon, the orange-red of turmeric, the red of the chilli peppers, the soft green of cardamon, the burgundy of sumac… Just a touch of them can transform a common dish into one that stimulates the senses and has you pleading for more. But it is not that simple: The right spice on the right dish and in the right quantity is required. Spices are not the bad cook’s stuff; spices and herbs have their own rules. Besides, their use did not start just for the taste. Their antibacterial, antiparasitic, antiseptic, digestive and general healing properties made them a key ingredient of food in the countries that produced them. Every food has its spice. In countries that have had and used spices in abundance, over time brilliant blends were created, typical of each area and its cuisine. Often, there are secret “exclusive” formulas for each house or shop, although their basic ingredients are known. For some, the final mixture should not stand and dominate any of the individual spices if it was successful. 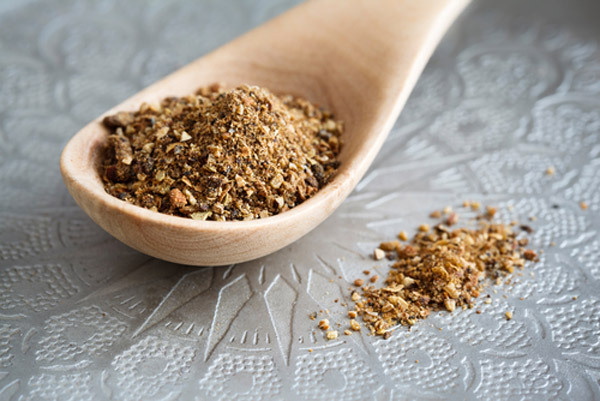 A masterfully blended spice mixture is not ingredients alone – the blend has its own distinct and balanced flavour. 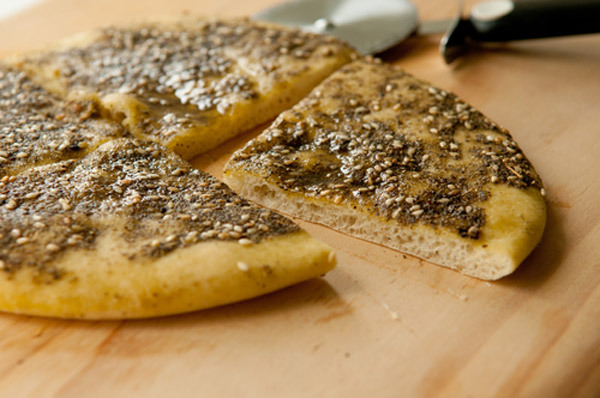 There are also blends however, in which a taste (such as thyme in Za’atar) prevails in all the variations. None of them has just one recipe though. Countless variations with the same name, are adjusted to the specific use or taste of the maker or spice blender. The way of their preparation follows a few rules: initially, the spices in seeds are roasted whole for a very few minutes, until they release their aromas. Then they are ground in a mortar or a spice mill. Finally, they may mix with any other fine or ground spice and stored in jars for 2-3 months or more. Away from their homelands, blends are often prepared with a simplified process: many use spices already ground, they might not roast them. And instead of a mortar or spice mill, a blender might be used. Others buy them ready made… The flavour, of course, is not the same. There are dozens of blends, some of them are centuries old, others are newer. Here, we choose to get to know the most famous ones. In India, “Masala” means “mixture of spices.” Literally, garam masala means “hot mixure of spices” in English. 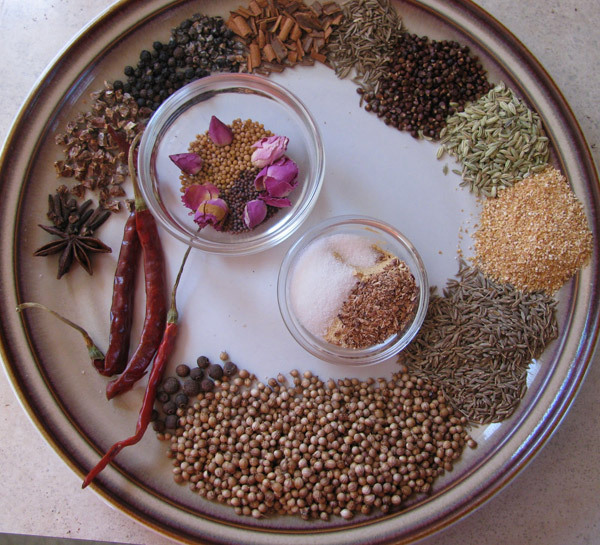 Garam masala is the most common blend of spices in Indian cuisine but it does have many variations. Materials and proportions vary depending on the food to which the blend is added including meat, fish, vegetables and pulses, but also vary according to taste and area. In its homeland, the mixture is often prepared immediately before use. If the spices and herbs have been finely ground, it is added to the food near the end of cooking, so that it does not lose its aroma. If using whole spices, they are added at the beginning into hot oil which helps the spices to release their own essential oils and infuse the cooking oil. We put the whole spices on their own in a small frying pan in medium heat for 1′-2 ‘, stirring until they release their aromas. We must be very careful not to burn the seeds. We put them in a bowl and mix them with the rest of the ingredients. We powder them in a spice mill, marble mortar or in a blender. In India, the masala is often used in a paste form. Curry is a “reminder” of the English from the time of colonial rule in India. The word is a British invention (it comes from a Madras food), while the blend is actually an Indian masala and tries to standardize a mixture of Indian cuisine spices in three heat intensities: mild, medium, hot. This gradient is determined by the amount of cayenne pepper contained in the mixture. The use of curry has even been extended to Chinese cuisine. Turmeric gives it the characteristic yellow color. Curry paste is also often used. We put the seeds alone in a frying pan on medium heat for 1-2minutes until they release their aromas and then mix them with the powdered/ground spices. 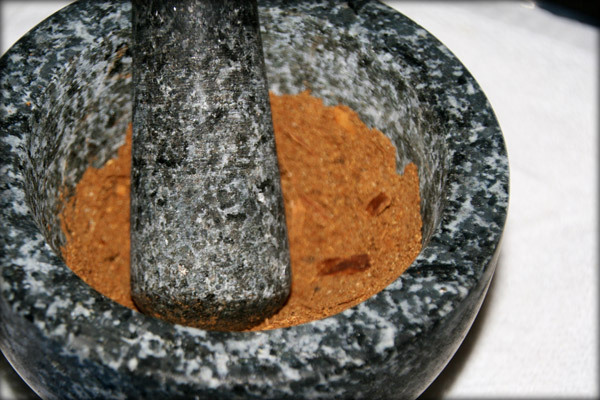 We grind the spices in a mill, a stone mortar or a blender. To make curry paste, add 2 tbsp. minced garlic and 2 tbsp. vinegar and mix well. The paste can be preserved in the refrigerator for 1 month. From rice to meat and fish with sauce, almost everything can have a curry sauce. A blend of spices in some Chinese cuisine typically uses 5 spices as a base in which sometimes a couple more are added. Powdered or finely ground in a mill or a blender. In some areas cinnamon is replaced with dried orange zest. 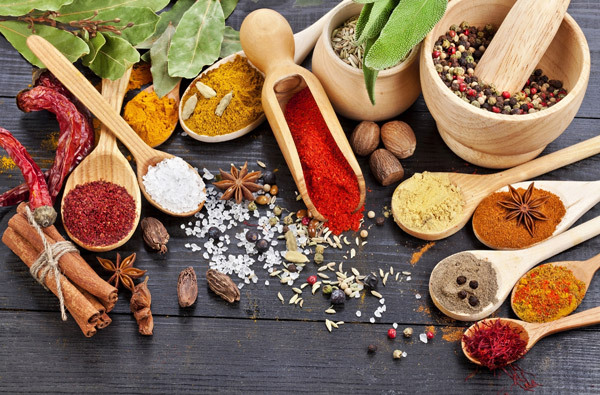 “Five spices” are used in Chinese cuisine on fatty dishes such as duck and pork, as a dry marinade on meat and poultry but also in other Asian kitchens apart the Chinese. 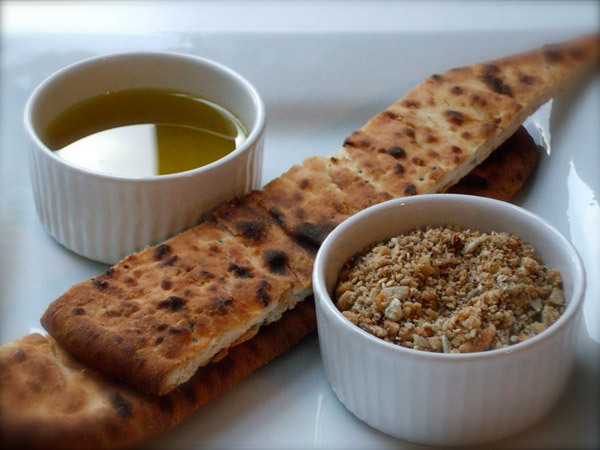 The top blend of Moroccan cuisine is translated “the top of the shop” and is made from premium quality spices. 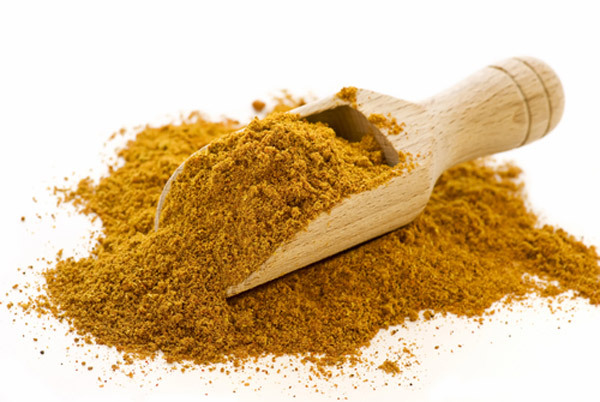 It is one of the most aromatic of all you can imagine in spice blends. The spice stores in Morocco keep their exclusive blend a sealed secret, which may contain over 50 different spices, and almost always, more than 20! Traditional housewives in this country also have their own “secret” blends that they rely on. But the real secret lies more in the proportions, which form a balanced final flavour in Moroccan dishes cooked in a tazine; dishes which can include lamb, chicken, vegetables, couscous, marinades and with som eversions, on fish and seafood. It will also add another sensory taste dimension to a kebab as well. Try it on lentils, which imparts to them an exotic colour. It also goes well with sweets or fruit salads. We grind all of them into a blender until we have a powder. 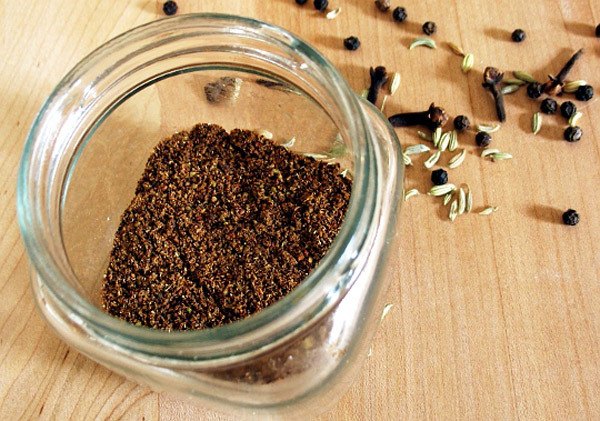 Ethiopian hot mix, a strong blend of Arabic and Indian spices. We put the seeds in a frying pan on low heat for 1-2 minutes. When they release their aromas we remove, put them in a blender with the rest of the spices and break them all together. 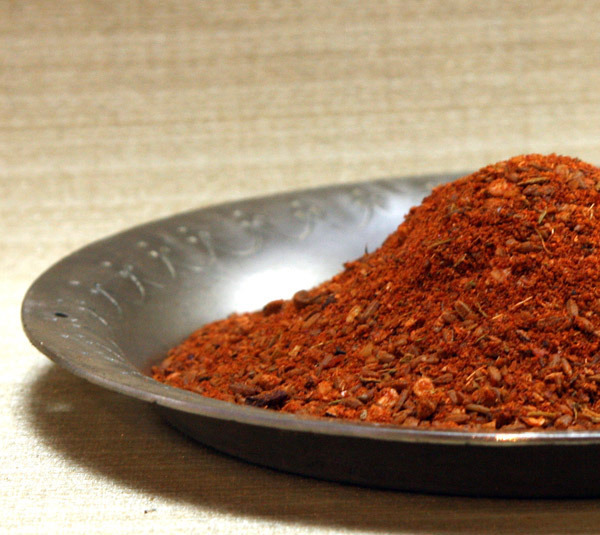 Baharat means “spice” in Arabic. But it is also a blend of Middle Eastern and North African countries with essential ingredients being the pepper and sweet spices, which bring out hot, fragrant aromas. It goes well with cooked meat in rich sauces, tomato sauces, moussaka, but you can also use it as a rub for lamb and other meat dishes. Add it to legumes like lentils or gigantes (large lima) beans with red sauce. We mix it with olive oil to marinate meats. Depending on the country, we will come across a differentiation in its ingredients. In a frying pan on low heat, we put the whole seeds alone for a couple of minutes. Then we mix them in the blender along with the remaining ingredients. We can also have a baharat paste if we mix our blend with minced garlic, finely chopped parsley and as much olive oil it takes. A blend of Eastern Mediterranean countries, along with Turkey and North Africa, based on thyme and other herbs combined with spices. The word means thyme (all its species). Sprinkle on pita with some olive oil and bake for a while in the oven, knead in bread, add to yogurt to create a dip, or to sauces for meat as well. It may also contain marjoram, mint, fennel, all spice. We grind them all in the blender. A few words on sumac: It comes from the dried fruit of the plant native to the Middle East and Mediterranean area. It has a deep burgundy colour and sour taste, and slightly spicy. Known from antiquity, it provided a subtle sour taste to dishes before the lemon appeared (the Romans introduced lemons to much of Europe). It is mostly used grounded in kebab, in various pot dishes, as a dry marinade and it is also a basic ingredient of Za’atar blend. Be aware that in North America, there exists poison sumac which is similar but not the same as sumac. But not all sumac in North America is poisonous. 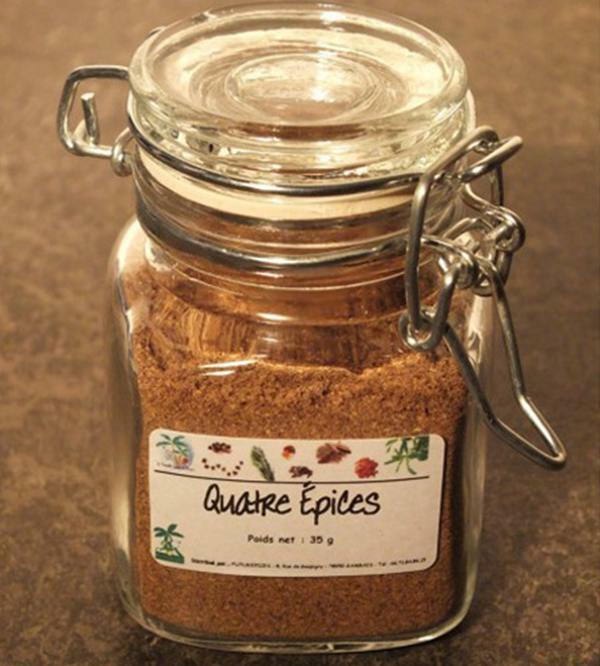 Egyptian blend of spices and nuts popular in the world and easy to use: as a dip (we dip bread or pitas first in olive oil and then in a bowl of dukkah), it is great in salads, but it can also be used as a crust for meat. We can have various ingredients and proportions in that one too. We first put the whole seeds and the sesame in a frying pan on medium heat for 1-2 minutes until they release their aromas. Then we coarsely grind them in a blender or mortar. The only European one in this collection originates in France of the 17th century – perhaps even earlier – and is still used today. It mainly flavors pate, terrin, and sausages, but it is also slowly cooked in ragout, stew and generally meats with rich sauces. The blend is often included in sweets like classic pain d ‘epices and biscuits. The spices we use should be of good quality. This is best ensured when we buy them whole and grind them ourselves close to the time we need to use them. Even dried forms should not be purchased as powdered or finely ground, if possible. We keep them firmly sealed in jars that are not plastic, in a cool dark place, away from light and humidity. Contact with air oxidizes them. Avoid making or buying large quantities, which will necessarily stay for months in your cupboards. When it comes to the use of the blends, be careful not to be carried away by their seductive scent and end up improvising if you’re not absolutely certain. They can destroy a dish that does not go well with them. Trust the recipes that include them in their ingredients. Enjoy your food! Take pleasure in eating! And before you leave – be sure to check out our gourmet quality premium Greek oregano, Thyme, Bay Leaves and Saffron right here!